By Michelle Kaczmarek and Emily Guerrero. Based at the Irving K. Barber Centre at the University of British Columbia, Indigitization is a collaborative project that provides grants and training to First Nations community groups to support their digitization projects. Digitizing First Nations materials involves unique challenges around access to information, storage of digitized material, and culturally appropriate knowledge organization systems. On June 10-12, 2016, past program participants met alongside others concerned with digitization practices and the management of Indigenous knowledge in communities to participate in the Indigitization Futures Forum. The Forum provided space to discuss past and future projects, share knowledge and best practices, and to work together to envision future paths for the community-based digitization work that Indigitization supports. At the forum, past participants spoke to the power of rooting their digitization projects within community, and discussed how specific community needs and protocol have shaped the outcome of their work. Joey Caro, from the Hul’qumi’num Treaty Group and Penelakut, discussed the need to prioritize traditional land use information according to which areas of the territories have projects proposed for them. Rory Housty from the Heiltsuk Cultural Education Centre spoke about his practice of digitizing recordings from families with upcoming potlatches, so that they can have access to those materials to help guide their practices. 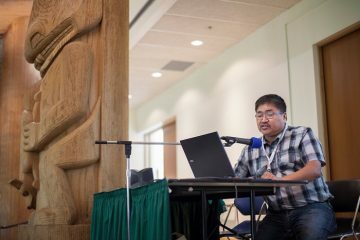 Other participants spoke of the complexity of representing sacred traditional knowledge within information systems, and shared the many ways in which communities have come together to augment existing systems to work for their needs, in some cases creating whole new open source systems to contain the knowledge. Presenters demonstrated their deep personal connections to the work, and teased out ways of incorporating these relationships into the projects themselves. Several panel members spoke to the importance of engaging both elders and youth within their projects, to both help shape the outcome and provide hands-on access to the materials. Marvin Williams from Lake Babine generously shared some of the history of the people that was learned through their digitized tapes. They are keeping their culture strong by passing this knowledge and techniques to their youth. Kate Hennessy discussed a project with the Dane-zaa people that incorporated participatory media making, where community members could come together to help curate the physical material which was to be digitized for the online gallery. This long-term approach to curation gave people time to raise and discuss concerns over local rights and the circulation of materials as they arose, and helped support participants’ ownership of the final galleries. Sherry Stump from the Tsilhqot’in Nation spoke about the Nation’s digitization of Traditional Use Studies, which took place from 1999-2001. Because the first release form did not account for digital access, the project has created a new form that specifically asks participants about their comfort with having information shared; elders can choose to make the materials publicly available for use only in educational purposes, or to keep it confidential. Alongside presentations from past grant participants, Futures Forum attendees also heard speakers from various universities and organizations. During the lunchtime keynote address, UBC faculty enriched the conversation with perspectives from further afield; Dr. Candace Kaleimamoowahinekapu Galla discussed some of the ways in which technology is being harnessed to support language revitalization in Hawai’i, and Dr. Mark Turin shared his experiences helping to leverage collections back into community hands with the Digital Himalaya project. With the focus of the weekend’s forum on looking to the future, presentations also contributed to the discussion of how community projects and the Indigitization program might evolve in the coming years. Panel guests provided plenty of inspiration and advice for those thinking about next steps in their projects. For many of those looking beyond their audiocassette digitization projects, the next big challenge is preserving the material housed on other deteriorating formats. Elizabeth McManus from Musqueam Archives discussed the idiosyncrasies of digitizing reel-to-reel audio recordings, and shared some of the unique aspects of the materials she’s handled in her work with Musqueam. Gerry Lawson from the Museum of Anthropology brought up ways in which digitization technology has changed over the past decade, and spoke to the need to move quickly with these projects, both to preserve deteriorating materials and to take advantage of the digitization technology while it is still available. At the end of the forum, participants came together to brainstorm and share their knowledge needs around project management, funding, communities of practice, and digitizing other media formats. The consensus of these conversations highlighted both the diverse and deeply important work already being done to support community-based digitization work, and the desire for greater connection among community projects to learn and discuss ideas. After this weekend of knowledge sharing and discussion, Indigitization hopes that the conversation will continue. The steering committee is excited to move forward, taking the stories and reflections shared at the forum and letting those guide the shape of the future of Indigitization. They hope to continue to create opportunities for communities to share experiences and knowledge. The Futures Forum program, including video recordings of some presentations, can be viewed at the Stories from the Forum webpage. For more information about Indigitization and its grant program, please visit Indigitization.ca.